This Little Whip Snake , Unechis flagellum was found by Steve at Longwood East ( Wildlife in your Backyard Field Walk ) under a sheet of iron. The little Whip snake is ovoviviparous . The female retains the embryos and gives birth to live young , which number 2 or 3 . The juveniles measure approximately 70 mm at birth. This species has a strange method of defending itself when handled roughly , coiling itself into a series of tight curls and flattening its body . The snake then resembles a shallow cone with its head at the apex . It is reluctant to bite when handled; the fangs are reduced and the venom dosage would be too small to cause any harmful effects to a healthy adult human . This snake occurs in open woodlands and grasslands . It is noctural in habit and may be found under rocks on well drained hillsides. Its diet consists of invertebrates and small skinks which occur in similar microhabitats. Previous Previous post: They’re yellow, but they’re not wattles! 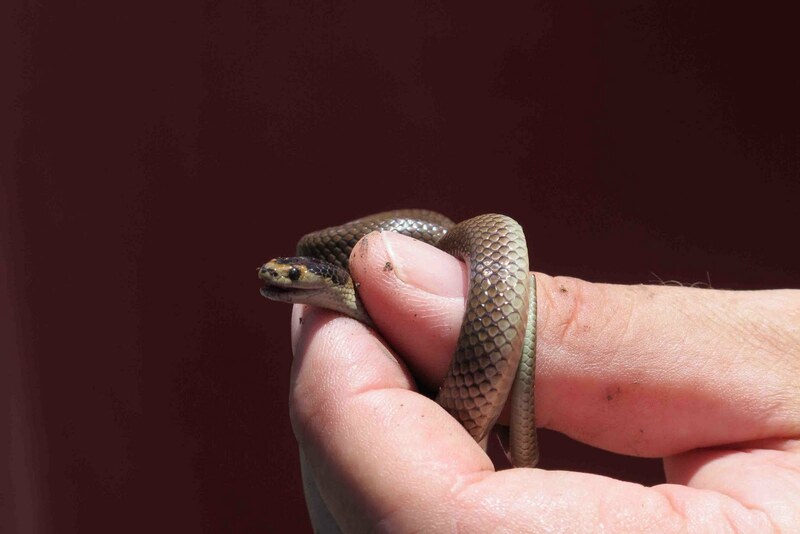 Little Whip Snakes are one of several species of small snake found in the Strathbogies. Another common little snake is the White-lipped Snake. I hope this comment displays as we’ve been having some problems. Comment box should now be a pop-up window.